At the time this was written, Friday of last week, my coworkers and I were attending When Faith Meets Pedagogy up at the International Plaza Hotel in Toronto. It’s a very big and very busy religious education conference, with over a thousand people attending, and Novalis has six tables laid out for our books and catalogues. I took a sample copy from the shelf to write my review, but there wasn’t enough time to finish it before we had to leave for the hotel. So I brought it home late that night, thinking I could dash off something short in a couple of hours, and flipped it open at my desk. A Year with Pope Francis is about Francis’s statements when he was Archbishop of Buenos Aires, with a few from his first year as Pope. Each day of the year gets a page and a short quotation, which are organized by themes: charity, humility, ecology, faith and life. Looking through it, I thought that it would be better for structured instead of casual reading. It’s a book that demands that you think about it, first and foremost. Not every message is easy. July 31st has “At the door of our schools death is sold (drugs). The rule of money with its demonic effects as drugs and human trafficking are commonplace.” October 26th has “Not only terrorism, repression or assassination, but also unfair economic structures that create huge inequalities, violate human rights.” Many of the pages feel like they’re meant to be discussed in a group, analyzed and talked about. But if the Pope is blunt and direct, he’s also determinedly hopeful. 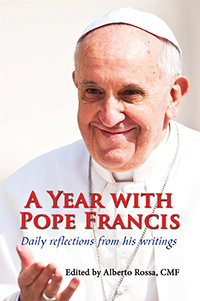 January 8th tells us, “Welcome the Risen Christ into your life as a friend, with trust: He is Life!” March 5 says, “Christian victory is always a cross, but a cross that is a flag of victory.” And August 23rd is a single sentence: “Love dispels ideologies.” Sometimes there are moments in A Year with Pope Francis that are simply, quietly inspiring, whether it’s for many readers together or just one. “The center is Jesus, not the successor of Peter,” is the message for January 1st, the very first one of the new year. Reading A Year with Pope Francis reminded me of a moment in another Novalis book, Francis: Bishop of Rome. Just after his election, the new Pope was offered the tailored red leather shoes of his office. “These are fine,” he replied, looking down at his regular black shoes–a new pair from his friends, bought because his old ones had become so scuffed up. That’s the kind of leader I wouldn’t mind spending a year with.